Make the lid of the sarcophagus by making a rectangle slightly larger than the base rectangle, decorate the lid, and fold and tape or glue to complete the lid. For clay, create a box and lid. 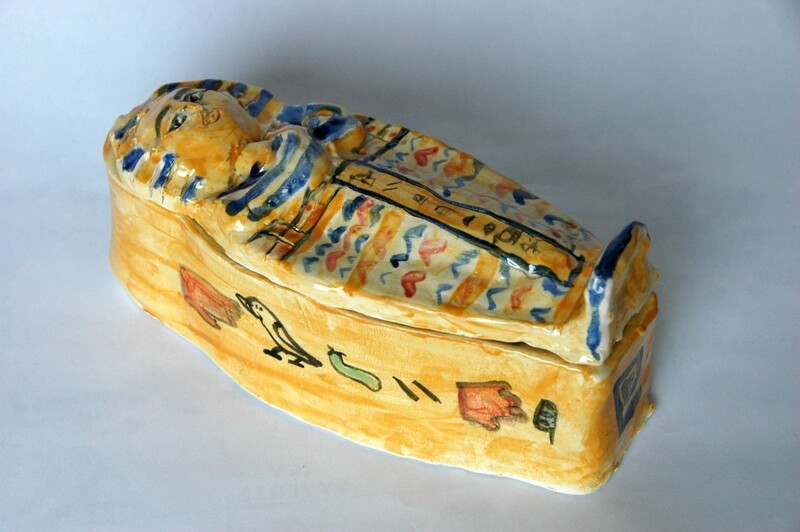 Whether you create a clay box or a mummy-shaped tomb, outline the decorations into the clay. Let the clay dry, and then paint the sarcophagus. Decorate the Mummy Coffin Craft. Almost the entire coffin was... 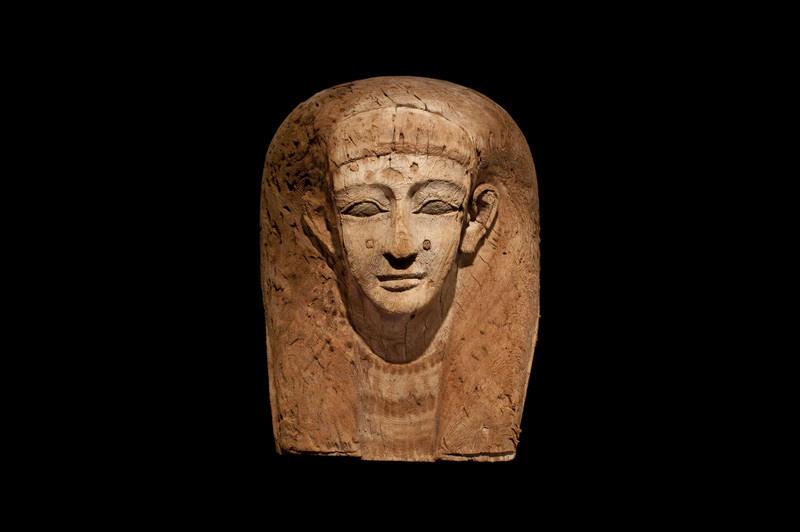 The outermost sarcophagus was often handed down from generation to generation, or from ruler to ruler, to solidify the family's position as Egyptian rulers. As a result, a former pharaoh's cartouche was often imprinted on the coffin. Merenptah's seal, for example, was also imprinted on Psusennes' sarcophagus, even though he died 150 years before Psusennes inherited his position of power. 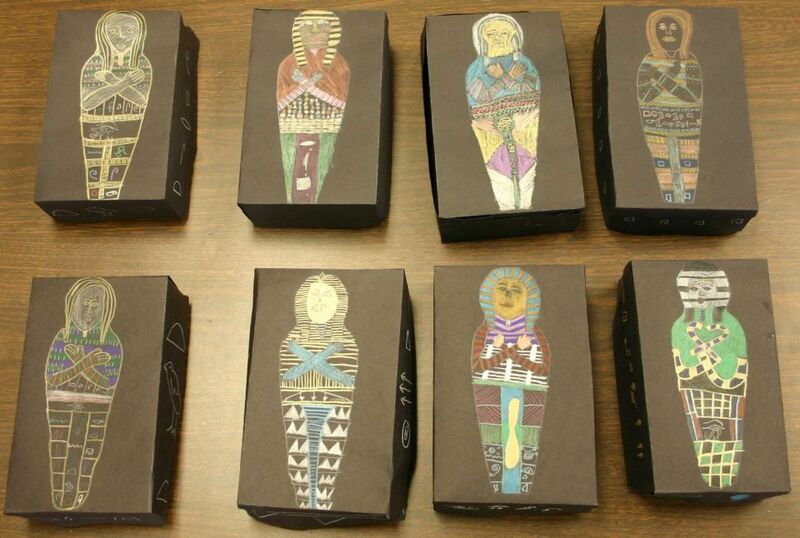 Draw the shape of a sarcophagus on six pieces of cardboard. One drawing is for the top, one for the bottom, and four for the sides. The top and bottom need to be in the shape of a body with a rounded head, neck, outside of the shoulders, legs and feet. how to make rolled dumplings with flour 14/12/2018 · If you want to make a sarcophagus for your mummy, start by wrapping a plastic bag around it and covering the bag in paper mache. Then, let the sarcophagus dry for 1-2 days before cutting it in half and painting it gold, red, blue, and green. Design a Sarcophagus In Ancient Egypt, a sarcophagus was usually the external layer of protection for a royal mummy, with several layers of similar shaped coffins nested within. Some of the layers were often highly decorative, and even made of gold or silver. how to say beautiful in egyptian arabic Ancient Egypt Lessons Ancient Egypt Crafts Egyptian Crafts Egyptian Party Egyptian Costume Kids Ancient Egypt For Kids Egyptian Mummies Ancient History Mummy Crafts Forward Make this Egyptian Sarcophagus & Mummy DIY Paper Craft project with a Cricut Explore – or cut out by hand. They were encouraged to draw 3-5 Egyptian hieroglyphs and make ups 2 or more of their own symbols. Then they could color in their sarcophagi however they wanted. Then they could color in their sarcophagi however they wanted. I decided to build the sarcophagus in two big separate pieces — the back panel, and the outer walls — and combine them at the end. I started by printing out just the curved parts of the sarcophagus, in order to save some paper.